Much is being made about the dress that First Lady Michelle Obama wore to the President's jobs speech last night. If you are not familiar with the very famous purple sheath dress made by Maria Pinto than allow me to refresh your memory. It was in this dress that the infamous 'dap' heard around the world happen. Remember when the President finally clinch the Democratic nomination from Hillary Clinton? His proud wife exuberantly walked onto that St. Paul, Minnesota stage clad in royal purple, but just before she left the stage to allow her husband his moment she made a gesture that had people talking for days. Mrs. Obama gave her husband some 'dap' (or as Fox News called it a 'Terrorist Fist Jab') and the rest as we know is history. Well, Mrs. Obama decided to break out the ol' 'dap' dress and it certainly got people talking. Many are trying to prognastoize as to what this mean. Is the First Lady sending a message to let the Republicans know that her husband is in full campaign mode and in it to win it or does she just like the dress? I personally think Mrs. O is sending a message. This family is very savvy and they know how to win a campaign. She's being subtle but the message is loud and clear; the Obamas are ready for battle. You may ask yourself how can you get all that from one dress? Well, that's not just any dress and the Obamas are well aware of that. 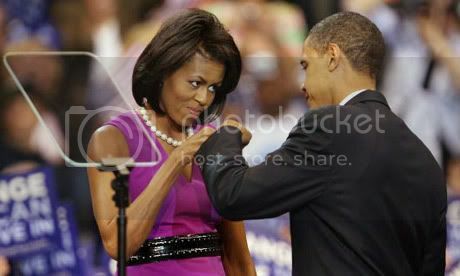 Funny...I remember that "dap" moment very well. had no idea that it would bring about such drama. I didn't recognize that she was wearing the same dress. I guess in a world where people "read between the lines" all the time, I can understand the idea of her sending a message. But I wouldn't be surprised if she decided to wear the dress because she just felt like it. I'm actually surprised that she wore it again. I'm sure she's been offered so many different pieces that she may never have to wear anything twice ever again. THE "DAP DRESS" WAS NOT MADE BY DAPWEAR INTERNATIONAL BUT DESIGNED BY MARIA PINTO.